In 2011, Theron Humphrey examined his life and, like many people, felt he wasn’t living up to his personal and creative potential. He decided to take a trip across America to meet, photograph and tell the story of one person each day. For company, he brought along his sweet-natured rescue Coonhound, Maddie. “I figured if Steinbeck had Charley by his side on his American travels, I needed a good dog next to me in my truck,” he said. While Theron pursued his ambitious plan, he also took photos of Maddie whose mellow nature and uncanny sense of balance made for surprising and captivating photos.Theron shared the resulting images via Instagram and Tumblr to the delight of a rapidlygrowing group of followers. Theron and Maddie will be at the Penguin Bookshop on Thursday, April 18 at 5:00 p.m.You will never know if Maddie is able to balance on bookshelves unless you join us. Craft is an act of making. Craft is expressive. Craft is what makes us human. 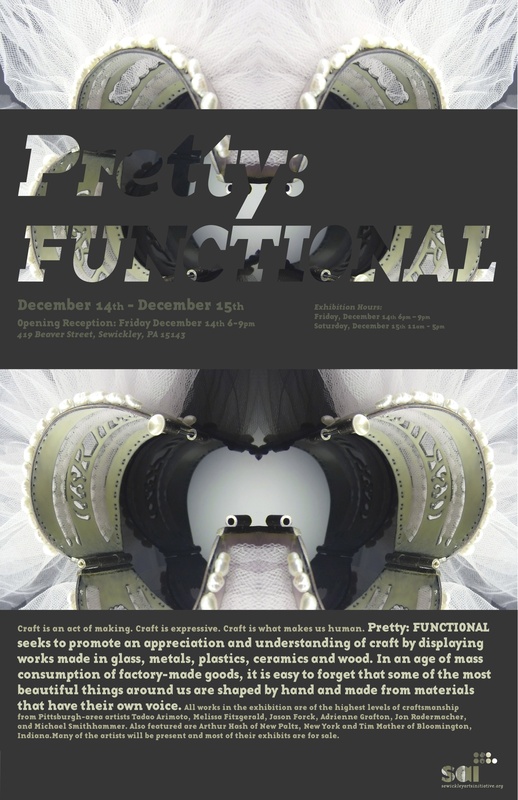 Pretty: FUNCTIONAL seeks to promote an appreciation and understanding of craft by displaying works made in glass, metals, plastics, ceramics and wood. In an age of mass consumption of factory-made goods, it is easy to forget that some of the most beautiful things around us are shaped by hand and made from materials that have their own voice. All works in the exhibition are of the highest levels of craftsmanship from Pittsburgh-area artists Tadao Arimoto, Melissa Fitzgerald, Jason Forck, Adrienne Grafton, Jon Radermacher, and Michael Smithhammer. Also featured are Arthur Hash of New Paltz, New York and Tim Mather of Bloomington, Indiana. Many of the artists will be present and most of their exhibits are for sale. As a child, I had never imagined my mother telling me to get on my Nintendo and do my homework. The Nintendo was a playful tool used to escape my day-to-day life, and it allowed me to enter fantastic worlds and experience a grand new narrative form. I also had a very active imagination and would play with Legos and action figures to experience various impossible story lines that blended genres with all types of play modalities. The artists represented here have moved beyond childhood aspirations for escape to make games and play an important aspect of their design, professional, and serious lives. These artists have dared to challenge and expand traditional definitions of how we look at and interact with art. If one of the functions of art is to engage the viewer with The Sublime, then these artists have successfully persuaded viewers and Players to actively participate in worlds of possibility. Such participation allows for a shared experience within the Game world, thus connecting the artist and Player-Participant in the realm of The Sublime. If art is limited only by the imagination, the role of Play can not be understated. As people (young and old) Play, they are free to engage or disengage from the rules and norms of society. Many active professionals who study the human condition consider autonomous decision-making to be an important aspect of healthy human development. Art too provides an arena in which one may be critical of society. Games and Play allow Players the freedom to engage in such imaginative – and sometimes subversive – discourse. I experienced The Sublime moment many years ago as a boy. I was not in an art gallery or in a specific,guided environment. I was playing Super Mario Brothers 2 on the original Nintendo Entertainment System. After several days, I reached the end where I was to stand toe-to-toe with the main villain, an evil frog. I was able to defeat this monstrosity but was treated to a different type of ending than I had expected. The main character and protagonist of the game, Mario,was asleep in bed. He awoke, saw that there was no apparent danger or struggle to be had, closed his eyes, and continued to sleep. A lovely lullaby-like tune played in the background. At that moment, I realized that what I had experienced in this universe was a dream. All of the explosive and dangerous experiences were, in fact, not real for Mario either. The makers of the game had indeed subverted the reality of the game universe and thus my expectation surrounding how a game ought to conclude. I stared at the screen for almost 10 minutes as Mario continued to slumber and the lullaby kept all danger at bay. I quietly wiped a tear from my eye, turned off the game, and went to the washroom to clean up for dinner. Forward by Miguel A. Tarango with Gina Schlesselman-Tarango. Come out and play a few seriously artful games Oct. 26th & 27th. More details soon.